The data now impose severe constraints on composite alternatives to the elementary Higgs boson of the Standard Model. However, they do not yet challenge the predictions of supersymmetric models, which typically make predictions much closer to the Standard Model values. We therefore infer that the Higgs coupling measurements, as well as its mass, provide circumstantial support to supersymmetry as opposed to these minimal composite alternatives, though this inference is not conclusive. They say that further progress on the understanding of this particle could be granted after the upgraded LHC will run and, indeed, nobody is expecting some dramatic change into this scenario from the data at hand. A Higgs particle but which one? After Moriond conference last week, and while Moriond QCD and Aspen conferences are running yet, an important conclusion can be drawn and it is the one given in this CERN press release. The particle announced on 4th July last year is for certain a Higgs particle as it has spin 0, positive parity and couples almost like the Standard Model Higgs particle to all others. The agreement with Standard Model is embarrassingly increasing as cumulated data since last year are analyzed. 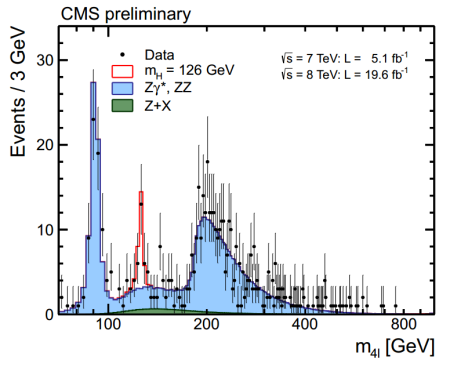 Today, CMS will also update their results for the decay and we will know if the small deviation observed by ATLAS will be confirmed. It is true that they see such a deviation with a larger dataset but, rather to increase, it has slightly diminished and this is not really encouraging. So far, no other particle has been seen and no new physics beyond the Standard Model is seen at the horizon. There is some people pushing for a conclusive assignment of the nature of this boson to the vanilla Higgs particle postulated in the sixties. But it is really too early yet to draw such a conclusion and I have explained why in a paper of mine appeared today on arxiv (see here). Indeed, a formulation of the Higgs field is possible such that, at the tree level, coincides with the original Higgs field (a Higgs impostor). This is due to the existence of exact solutions of the equations of motion of such a field (see here). The relevant point to tell which one is realized in nature is through the decay rate in WW and ZZ and, with the current data, there is agreement for both yet. But, being amplitudes exponentially damped, higher excited states of the Higgs boson cannot be easily seen presently and their eventual observation appears as a statistical fluctuation yet. This can be evaluated quantitatively. It is important because the ZZ decay is sensible to higher masses and displays some peaks that reveal themselves as statistical fluctuations. Increasing the number of events could turn these peaks into real observations. The interesting point here is that we are moving form the discovery moment to the study phase with a lot of room for improving measurements on this Higgs particle. But the analysis for the existence of higher excited states, Higgs’ brothers, is just at its infancy. 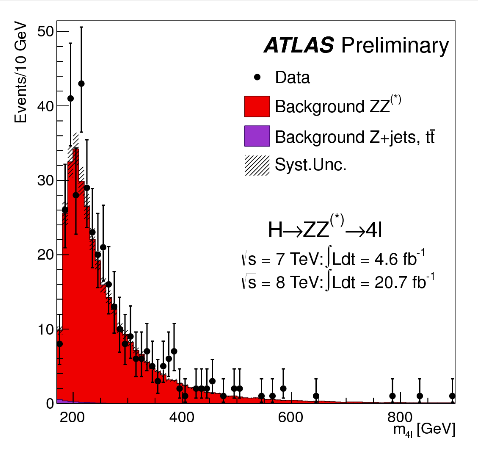 Update: This the analogous figure from ATLAS while the figure for from CMS agrees quite well with the Standard Model: . You are currently browsing the The Gauge Connection blog archives for March, 2013.